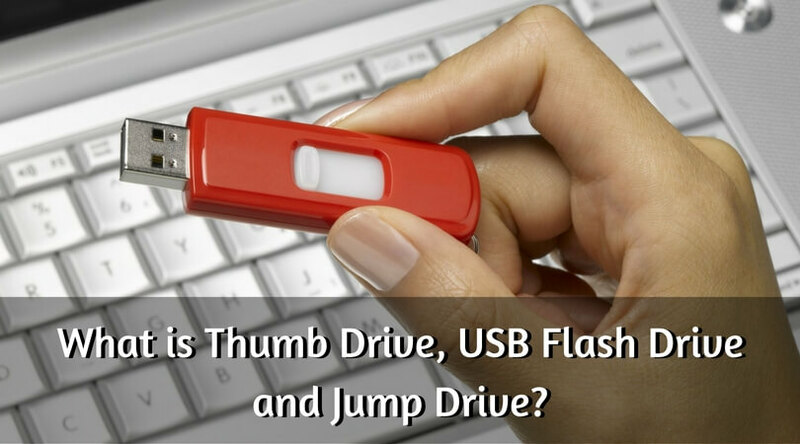 What is Thumb Drive, USB Flash Drive and Jump Drive? Every country has its own language, and the many things have different names in different regions. Same thing applies in technical terms as one particular device or technique has a different name in around the world. Today, we will talk about the storage drives i.e. thumb drive, USB flash drive, and Jump drive. All these are the storage devices examples. We will see the difference between flash drive and thumb drive and will check comparison of jump drive Vs flash drive. A solid state drive which uses a USB port to connect with a particular device is called a thumb drive. It is a portable drive which is also known as a USB drive or flash drive. It is referred to as a thumb drive mainly because it has a small size and shape than a standard storage drive. It has dimensions of just a few inches in both width and length. You can transfer the data to and from your PC with this easy-to-use thumb drive with the help of the USB technology and standard protocols. A USB WiFi adapter is an excellent example of such technology. Unlike to the larger hard disks that are commonly used in the PCs, the solid state thumb drive is tiny in size and contains no moving parts. It has an integrated circuit design which provides the data storage and rewriting functionality. With the inspiration of this technology, the technology brands have started to make small storage items like small MP3 players, storage cards for cameras, etc. As you read before, the thumb drive is also known as a flash drive due to the same functionality and working. Both the drives have similar features, but there are some differences between a flash drive and thumb drive. Let’s check them. We have the answer to what is a thumb drive, so we will see the details about the flash drive. A flash drive is a data storage device which acts as a portable hard drive for you. It can transfer data from one device to another device with the capability of both reading and writing data. It includes an integrated USB (Universal Serial Bus) interface and a flash memory. It is a durable and reliable mass storage device which is faster to operate and easily removable. It can store more data than the floppy disks and optical disk drives at faster rates. All the Operating Systems and BIOS are supported by the flash drives. A flash drive is used to read/write data from one device to another. Due to its compact size, you can easily carry it wherever you go and so it is a perfect alternative to using than a hard drive for traveling purpose. Flash drives come in a variety of sizes to allow you get the most suitable for your use. Unlike to the flash drive, a thumb drive comes with a switch located at the bottom. This feature makes it a digital lock box with a writing protection feature. When the switch is locked, you can only read the data from the thumb drive and cannot delete or write the data on it. And when you unlock the switch, you will be able to read and write data on a thumb drive. This feature provides protection against deleting the data accidently. Both the flash drive and thumb drive are easy-to-carry, have a support of all the Operating Systems, and are better to use than the CD, floppy disk, or external hard drives. A jump drive is also a portable storage device and often known as a USB flash drive, pen drive, key chain drive, etc. Generally, it comes in a size of a human thumb and so is called as a jump drive. Same as the flash drive and thumb drive, it connects via a USB port on a device and is used to transfer data from one device to another. If we see the comparison of the jump drive Vs flash drive, then we can say that both are the same devices having different names (I mentioned this earlier in the blog). Only a mentionable difference is that the flash drive has a flash non-volatile storage medium. Such flash memory is also used in other storage devices like solid-state drives, memory cards, etc. When we check the storage devices examples, we see the results prompted with the names of flash drives, jump drives, thumb drives, etc. All these storage drives are portable, easy-to-carry, removable, rewritable, have encrypted read/write functionality, and are the great solution for keeping professional and personal data. Different storage devices are available in different sizes, shapes, colors, and capacities. You can choose the best USB adapter drive as per your requirements and budget. ©	Copyright Best USB Wifi Adapters. All Rights Reserved.